Hello! Happy Thursday, friends. Thank you for all the messages, emails, and texts after my last post. You all are so sweet, and I'm glad some of you were encouraged by what I shared. Just trying to take it one day at a time and find a new routine! 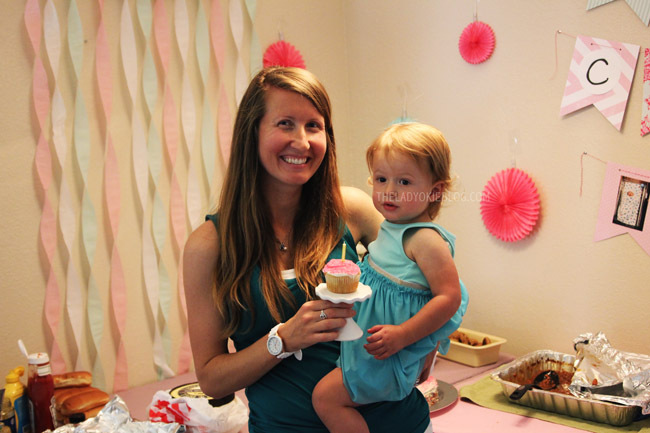 I wanted to share with you some pictures from R's second birthday party. It was a great time! Like I mentioned in a previous post, I didn't have a theme for this party, and I really only started planning a few weeks before. 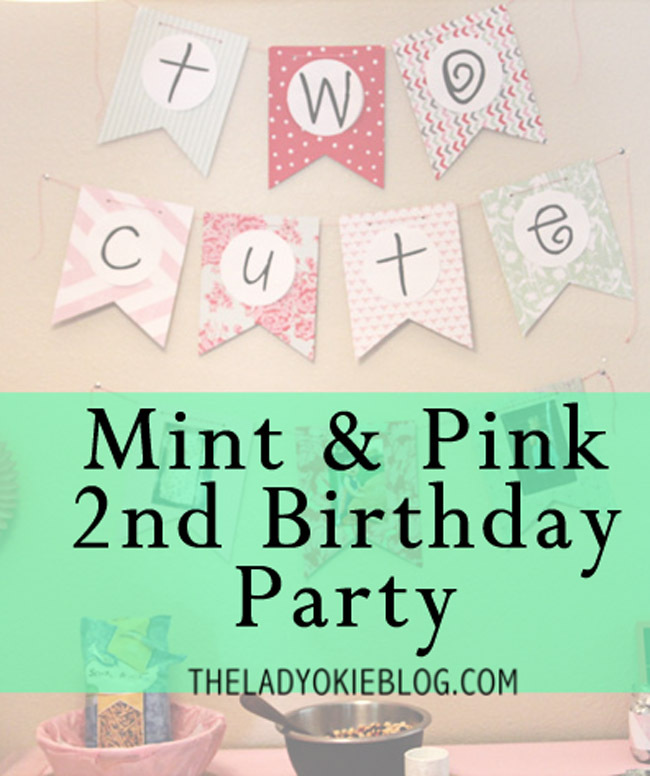 One afternoon I wandered around Hobby Lobby tossing random things into my cart that I liked, and I realized that everything I was grabbing was either the color mint or pink, so I decided to center the party around those colors. And because last year I did pink and gold for R's first birthday, I was able to reuse some of the things I had bought or made for her. I love how it all turned out! We moved our kitchen table and set up two longer tables to create a little food/dessert area. Jordan grilled hot dogs, and we had chips, homemade trail mix (peanuts, m&ms, raisins, and corn nuts), baked beans, and grapes. For dessert I made a funfetti cake, and R had her own individual cupcake. I bought a gallon of ice cream, and there were cookies and mini cupcakes from a local bakery. ^^^ I decided to make a cupcake just for R. That way she wouldn't have a giant slice of cake and would be able to eat this herself. 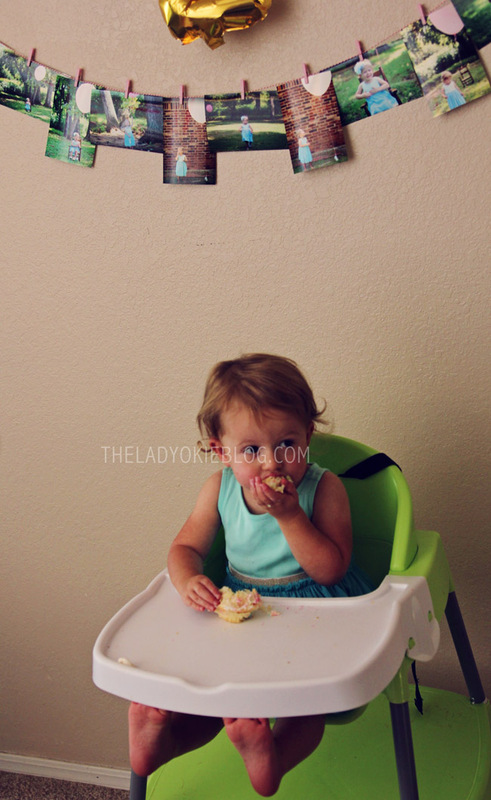 I also put a picture from her first birthday. 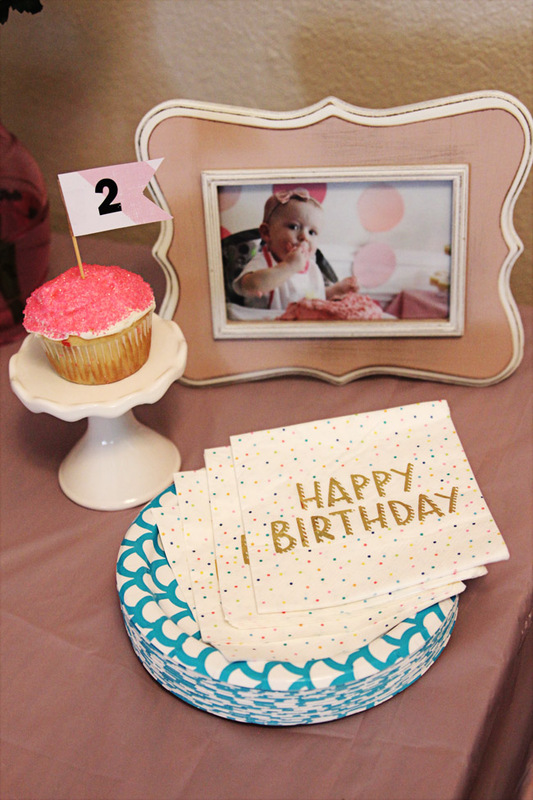 I found the Happy Birthday napkins and cupcake stand at the Target dollar spot. The plates are from Big Lots. I made the "2" flag for the cupcake. 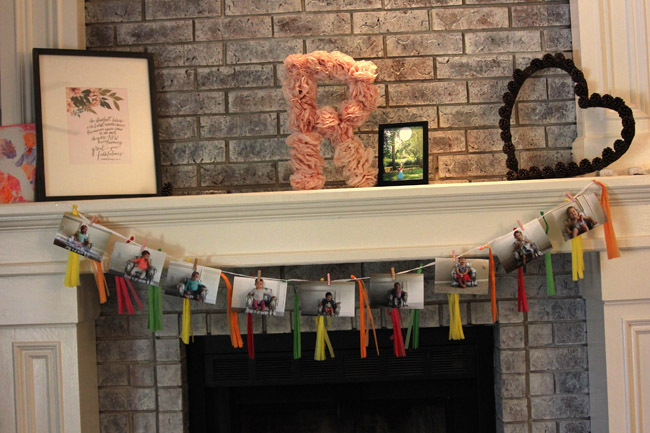 I reused the "R" I made for her first birthday, which is awesome because it took me so long to make! 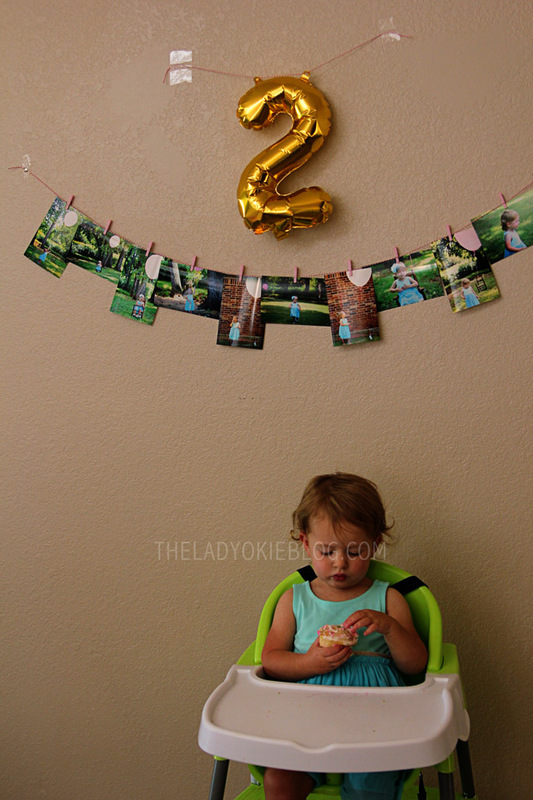 The tassel banner is from the Target dollar spot, and I printed off monthly chair pictures from 12 to 24 months. 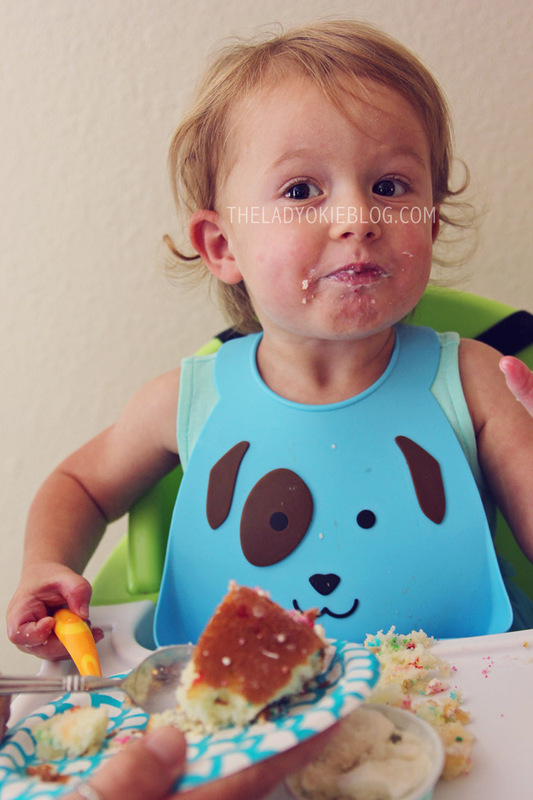 She was so funny with her cupcake and ate it pretty daintily compared to last year when she went in with both fists. ^^^ I bought a roll of pink wrapping paper and created a photo area. After opening gifts, we took family pictures in front of it! The banner is reused from last year. 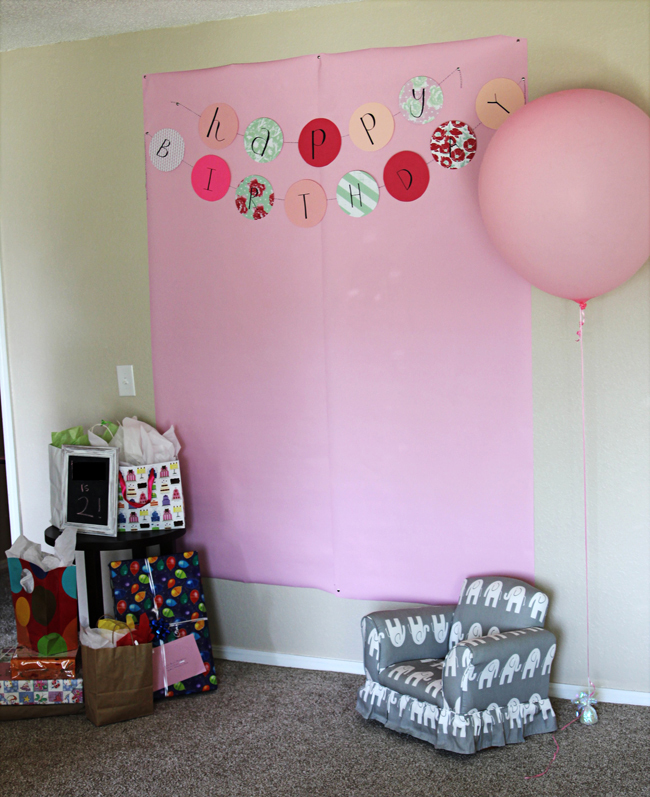 I swapped out a few of the pink circles for circles using scrapbook paper, and my sister wrote "Happy Birthday." The giant balloon from the park pictures the week before was still inflated, so we used it too! 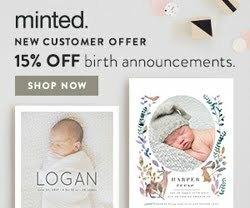 Bumgarner, party of four! I thought getting pictures with a toddler was hard, but try a toddler and a newborn. It's a miracle there's one of all of us looking and with J's eyes open. Funny story, I legitimately kept forgetting about J since there were so many family members around who wanted to hold him. I would randomly panic and realize I hadn't seen him in a while and had no idea where he was, but he was always just sleeping on someone. I am obviously still getting used to having two kids. Ha! 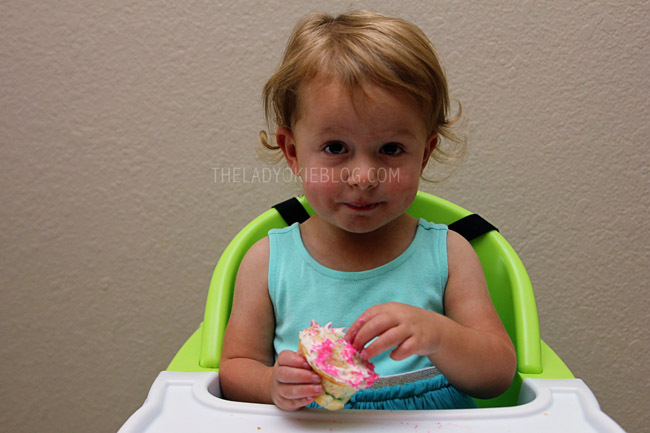 I love those colors, and I LOVE how sassy she looks in the cupcake pictures. So cute!! Great color combo. 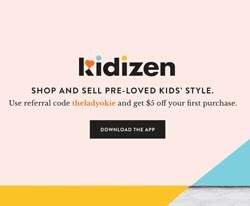 Everything looks really cute - especially that little birthday girl! Super cute! 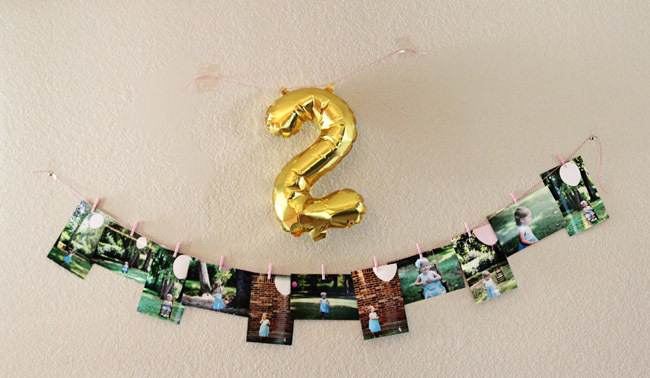 I hope this comes out right but I love that your decorations are really adorable yet not over-the-top Pinterest-y perfection (and doesn't appear to be super $$ either). 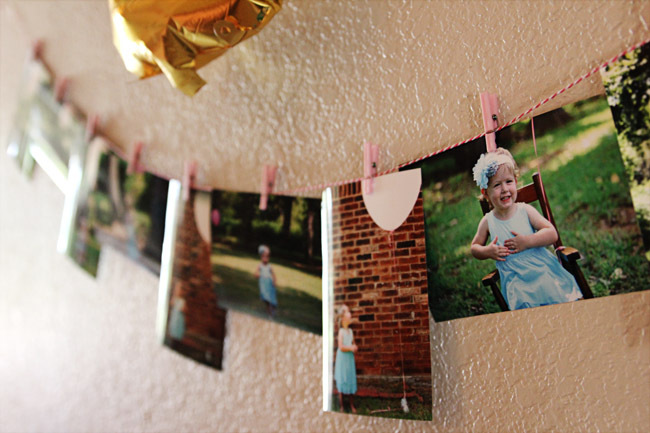 I love the photo area - Such a great idea to have the wrapping paper backdrop. 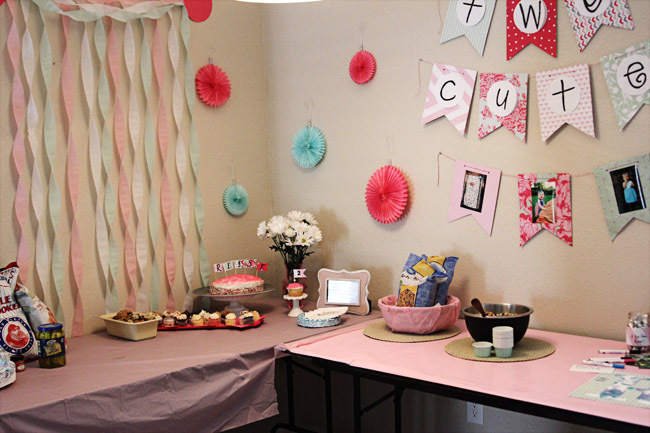 My daughter is turning 4 in November but I'm already starting to think about her party - Might do a tea party theme! My son will also be 2 the day after Thanksgiving but the curse of the younger child and having a birthday so close to the holiday is all he'll get this year is a birthday breakfast with the grandparents. 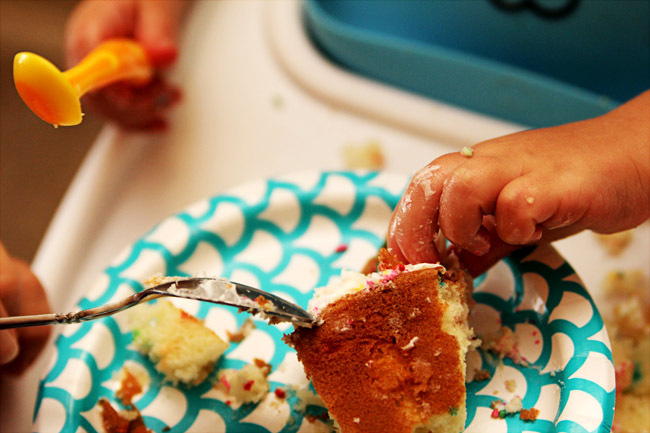 Maybe once he's older and cares I'll be able to manage two actual parties on back to back weekends, or maybe they'll have to get used to having a combined birthday party... We'll see! That's so fun that you kept doing your chair pictures every month--I didn't realize you'd kept it up! 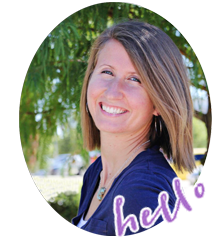 I'm sure you'll be so glad you did that, and I know your kids will appreciate seeing themselves grow month by month too! R is so big! It's been awhile since I've seen am upclose face pic of her. Two-years old is super awesome and fun! TWO! I can't even believe it! Great job with pulling everything off! 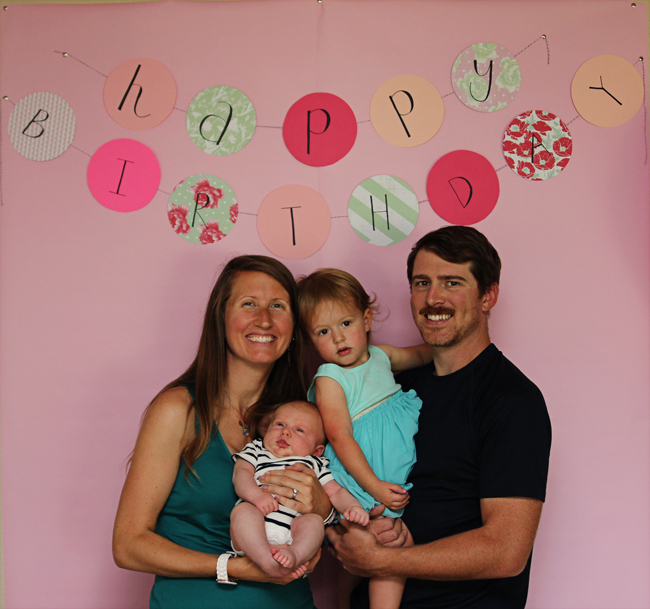 That is a GREAT family picture of you guys and hilarious about how you kept "forgetting" about the baby!! So sweet! 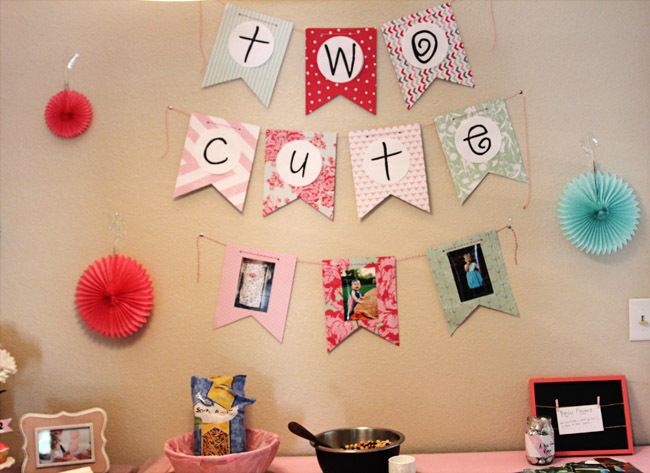 I love the "two cute" theme!! Everything looks great! I'm glad you had some extra hands with J- of course no one wanted to put that bundle of cuteness down!! Love it! You did a great job planning it mama, AND with a newborn too! Looks like Reese had a very special day is obviously SO special and loved! Happy birthday to R! I can't believe she's 2 already! Time has flown by! I love the "two cute" play on words! And all the decor is adorable. Well done! I love the strategy of keeping one color the same but just rotating to a new complementary color for the decor! 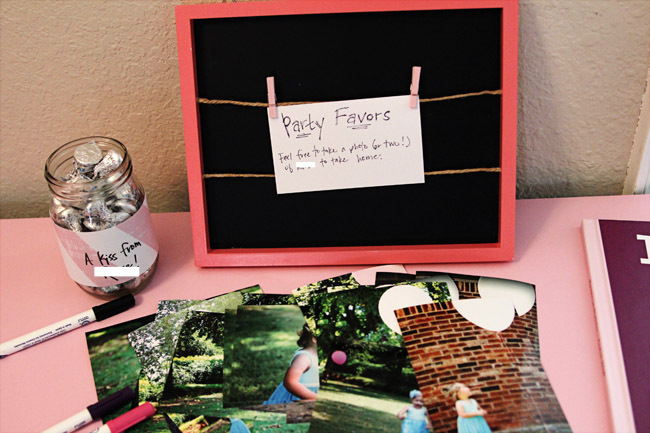 Sounds yummy, and pictures are definitely a great party favor for a kids party! Love the family photo at the end! Also, R looks so big!!! She doesn't look like a baby but a toddler. I'm glad you all had a good party for her. It's fun that you can get together with family.